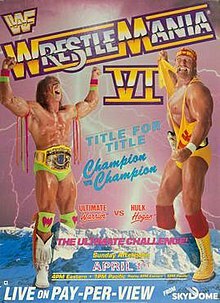 WrestleMania VI was the sixth WrestleMania professional wrestling pay-per-view (PPV) event produced by the World Wrestling Federation (WWF) and the first to be held outside of the United States. It took place on April 1, 1990, at the SkyDome in Toronto, Ontario, Canada, with an announced attendance of 67,678 – then a record for the Skydome. Aside from its record-breaking attendance, the event is arguably best remembered for "The Ultimate Challenge" – the main event match which saw Hulk Hogan (WWF World Heavyweight Champion) vs. The Ultimate Warrior (WWF Intercontinental Heavyweight Champion), in which both championship titles were on the line. On February 3, 1990, a week after Hogan and Warrior crossed paths in the 1990 Royal Rumble match, Hogan put forth "The Ultimate Challenge" to Warrior, and had to know whether Hulkamania or the power of Warrior was the strongest force in the WWF. On February 10, the match was officially announced as the main event of WrestleMania VI by then WWF President Jack Tunney. On February 24, Tunney announced that both the WWF World Heavyweight Championship and Intercontinental Heavyweight Championship would be on the line for the first-time ever during the match. At WrestleMania VI, Warrior won his sole WWF World Heavyweight Championship. At WrestleMania VI, Brutus Beefcake was the first person to pin Mr. Perfect in a televised match, thus ending Perfect's lengthy undefeated streak on television. Robert Goulet sang a rendition of O Canada before the event. Future multi-time world champions Edge and Christian were in attendance, as were Lance Storm and Renee Young. Diamond Dallas Page had a cameo on the show driving Rhythm and Blues and Jimmy Hart to the ring in his pink Cadillac. Actor Stephen Amell, who would go on to compete in a match at SummerSlam in 2015, was also in attendance. Mary Tyler Moore was sitting at ringside, and there was a backstage segment with Steve Allen and The Bolsheviks. Columnist Rona Barrett interviewed Miss Elizabeth at the event. Because Intercontinental Heavyweight Champion The Ultimate Warrior defeated Hulk Hogan to win the WWF World Heavyweight Championship, Warrior was stripped of the Intercontinental Heavyweight Championship, as the rules prohibited any wrestler from holding onto more than one singles belt simultaneously. An eight-man tournament, conducted on the WWF's syndicated Superstars, was held, with Mr. Perfect winning the title by defeating Tito Santana in the finals. When Brutus "The Barber" Beefcake defeated Mr Perfect at Wrestlemania VI, it was billed as Perfect's first pinfall loss in the WWF. However, in reality Perfect had been cleanly pinned by The Ultimate Warrior in a match less than 2 weeks prior to WrestleMania at Madison Square Garden. As new WWF World Heavyweight Champion, The Ultimate Warrior would initially be a successful main event draw, with his main rival being "Ravishing" Rick Rude – a wrestler he had fought during much of 1989 over the Intercontinental Heavyweight Championship – during the spring and summer of 1990. Meanwhile, Hogan wrestled several matches in Japan shortly after WrestleMania VI but soon began feuding with the 470-pound Earthquake, with that feud heating up when Earthquake sneak-attacked Hogan on The Brother Love Show in May. Announcers explained that Hogan's injuries from the attack and the loss to Warrior both took such a huge toll on his fighting spirit that he wanted to retire, and viewers were persuaded to write Hogan to encourage him to return. Hogan would return by SummerSlam in August 1990 and got revenge on Earthquake, dominating him in matches that continued into early 1991. Immediately following the Colossal Connection's WWF Tag Team Championship loss to Demolition, manager Bobby "the Brain" Heenan began yelling at Andre the Giant in the ring, blaming him for the loss and slapping him in the face. Andre grabbed Heenan and knocked Heenan out of the ring; when Haku attempted to sneak-attack Andre, Andre caught his leg and knocked Haku from the ring, making Andre a face for the first time in three years. Although he toured Japan in April, this would prove to be Andre's last televised match in the WWF as real-life health problems with acromegaly were continuing to take their toll. Andre returned to the WWF late in 1990 for several non-wrestling appearances that continued into 1991; Andre's health would continue to decline, and later died on January 27, 1993. Meanwhile, Demolition began a slow heel turn during the late spring and early summer of 1990, adding a third member Crush to the team. This was due to Bill Eadie (who competed as Ax) desiring to take a lesser active role in wrestling, and Crush and Smash would soon become the primary defenders of the belt. This was Jesse Ventura's last stint as color commentator at a WWF pay-per-view event. He continued his role as on-air color commentator for Superstars through August 1990, at which time he left the company. At the 1998 edition of their annual Halloween Havoc pay-per-view event, the WWF's now-defunct rival promotion World Championship Wrestling (WCW) pitted Hogan against Warrior once again. Hogan won with outside assistance, giving each man one victory apiece. The contest has garnered a legacy as one of the worst bouts in history, being vilified by critics, then-WCW president Eric Bischoff, and former company announcer Gene Okerlund. Bischoff has disputed the rumor that he hired Warrior merely to give Hogan an opportunity to avenge his WrestleMania VI loss. The event received mixed-to-positive reviews, though most reviewers praised the main event between Hogan and Warrior. Jason Powell was among the reviewers who praised the main event, calling it "A truly amazing match considering the limitations of both men, particularly Warrior". However, he went on to say, "The overall WrestleMania 6 card was softer than WrestleMania 5 card, but it was a better show that [sic] WrestleManias 1, 2, and 4". The Hulk Hogan-Ultimate Warrior match was named 1990's "Match of the Year" by Pro Wrestling Illustrated magazine readers. The match between Roddy Piper and Bad News Brown has received heavy criticism for featuring Piper (at that point a babyface) being painted in half-blackface against the African American Brown. ^ "WWF WrestleMania VI - "The Ultimate Challenge" « Events Database « CAGEMATCH - The Internet Wrestling Database". www.cagematch.net. Retrieved August 16, 2018. ^ Copeland, Adam. Adam Copeland On Edge. Stamford, Connecticut: WWE Books. p. 27. ISBN 978-0-7434-8347-6. ^ Storm, Lance (April 18, 2010). "WrestleMania VI". Commentary. StormWrestling.com. Archived from the original on April 22, 2010. Retrieved May 10, 2010. ^ "Christian". World Wrestling Entertainment. Archived from the original on December 14, 2009. Retrieved August 5, 2010. ^ Amell, Stephen. "Tweet". Twitter. Archived from the original on March 17, 2014. ^ a b "Demolition – The First Tag Team To Three-Peat". WWF Memories. July 12, 2016. Archived from the original on November 14, 2016. Retrieved November 13, 2016. ^ The Self Destruction of the Ultimate Warrior (DVD). WWE Home Video. 2005. Event occurs at 85–88 minutes. ^ "Powell's WrestleMania 6 review: Hulk Hogan vs. Ultimate Warrior for the WWF Championship and Intercontinental Championship, Ted DiBiase vs. Jake Roberts, Andre the Giant and Haku vs. Demolition for the WWF Tag Titles". www.prowrestling.net. Archived from the original on September 18, 2017. Retrieved November 27, 2017. ^ "5 Really Racist Storyline Moments Still on the WWE Network". Rolling Stone. Archived from the original on December 22, 2017. Retrieved November 27, 2017. ^ "WrestleMania VI". Pro Wrestling History. Archived from the original on March 29, 2007. Retrieved October 23, 2009.